The 2017 Nissan Maxima Platinum is built for luxury and features a 3.5L DOHC 24 Valve V6 engine capable of generating 300 horsepower peaking at 6,400 rpm and torque of 261 lb ft peaking at 4,400 rpm. The luxury sedan is powered by CVVTCS, direct ignition system of Nissan and variable induction system. The front wheel drive has drive by wire system, Xtronic CVT, drive mode and manual mode. 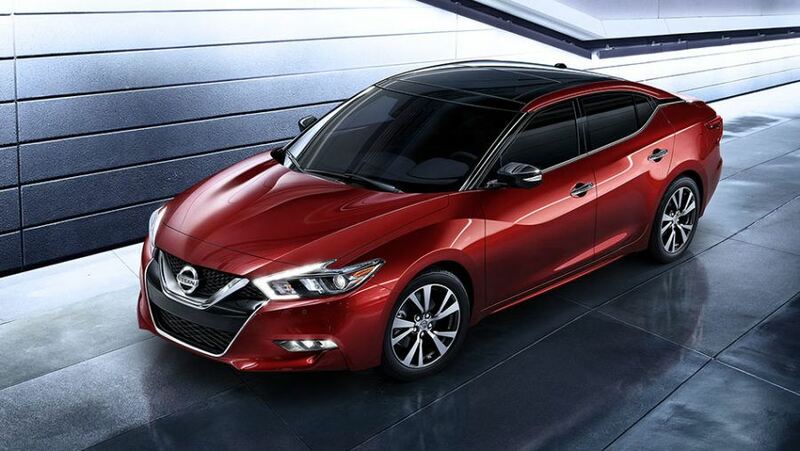 2017 Maxima Platinum has standard anti lock braking system on all four wheels, MacPherson strut suspension and independent multi-link suspension in the front and rear respectively, strut tower reinforcement, trunk chassis reinforcement and hydroelectric power steering. Maxima Platinum has aluminum alloy wheels, all season tires, LED daytime lights, low beam LED headlights, fog lights, dual mufflers, powered outside mirrors with LED signal indicators that can be folded and tilted down manually, the mirror on the driver side has auto dimming, there is a dual panel moon roof with easy one touch close and open, there is a sonar system applicable for rear and front. 2017 Nissan Maxima Platinum has Nissan Navigation System, voice recognition, SiriusXM compatibility, NissanConnectSM, CarPlay, display commander, hands-free messaging and phone, trip computer, Around View, moving object detection, HomeLink, cruise control and active noise cancellations with sound enhancement. View our inventory. 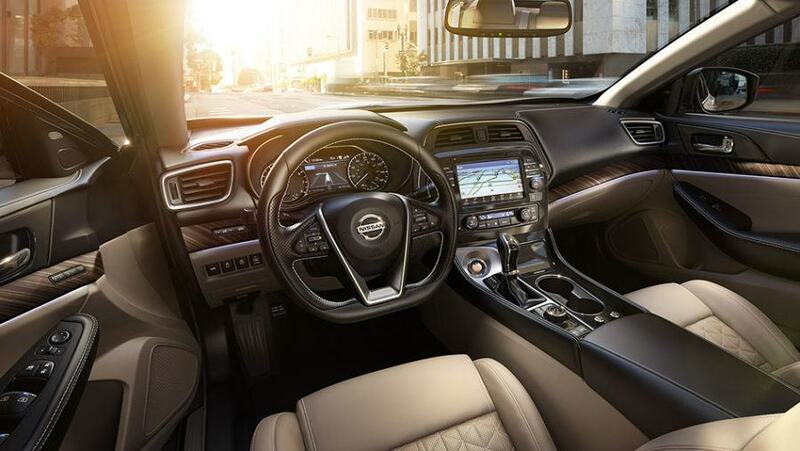 2017 Maxima Platinum has dual zone climate control with micro filter and vents in the rear. Driving the luxury sedan is a convenient experience with push button ignition, automatic intelligent temperature control, remote front windows and trunk release, powered door locks, auto locking, rain sensing wipers, map lights and reading lights, adjustable ambient lighting, illuminated vanity mirrors, power sunshade and fold down armrest in the rear seat with dual cup holders. Seating is as comfortable as it can get with the driver’s seat being 8-way power adjustable and there’s powered lumbar support. The front passenger seat is 4-way power adjustable. The steering wheel, driver’s seat and the outside mirrors have a memory system. Some of the other highlights of the Maxima Platinum are heated front seats and steering wheel, leather upholstery with inserts being diamond quilted, the mahogany trim, eleven Bose speakers, two USB ports, speed sensitive volume control, supplemental airbags with occupant classification and seat belt sensors, side impact airbags and roof mounted airbags, vehicle dynamic control, blind spot warning, forward emergency braking, prediction collision warning and LATCH among others. 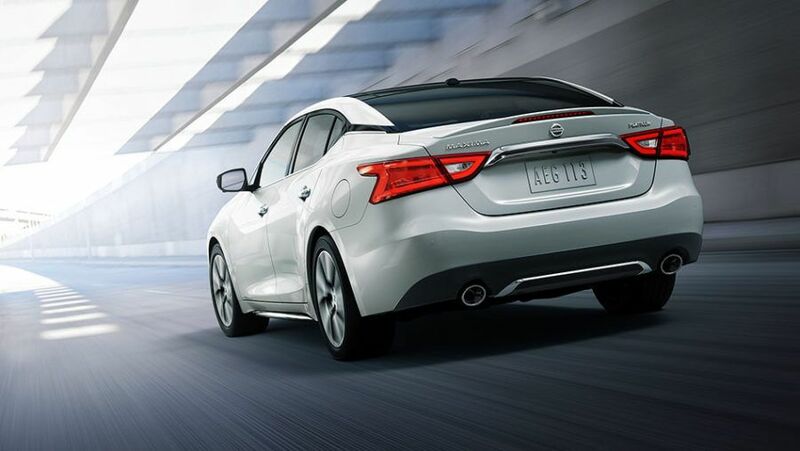 2017 Nissan Maxima Platinum Trim delivers 10.9 L/100Km on city roads and 7.7 L/100Km on highways. If you’re in the Whitby or Oshawa area, we invite you to book your test drive today!